Welcome to the 2017-18 season of the Havant Orchestras! 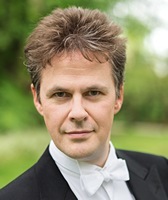 This year our pre-season “Popular Classics” concert with last year’s Bob Harding bursary conductor Tom Griffin was a week later than usual, so we are still humming tunes from “Die Fledermaus” as we start to prepare for our next concert. We always enjoy working with the young conductors and seeing them grow in confidence and experience. Tom enjoyed his time with us and we wish him success in his continuing musical career. We are looking forward to working with our new bursary holder Richard Miller during the coming season. 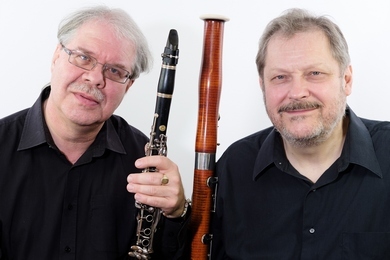 Our Havant Chamber Orchestra concert at Ferneham Hall on Saturday is centred around a delightful late work by Richard Strauss featuring our wind soloists Robert Blanken (clarinet) and Richard Moore (bassoon) as “The Princess” and “The Bear” respectively! The work also features a group of solo string players in addition to a harp and the rest of the strings. For more about the works, see Robin’s Notes from the Conductor below. Note that the order of the Fauré and Elgar works has been shuffled compared with the original sequence shown on the posters, to allow the soloists a short break to prepare during Elgar’s “Sospiri”, which is for strings and harp only. In addition to the HCO main concerts this season, we are also planning another visit to Emsworth Baptist Church for an HCO strings concert on 10th March 2018, as a follow-up to our very well-received concert last season. Further details will be published soon. Richard Moore will be talking about the Richard Strauss Duet-Concertino. The pre-concert interlude in the Octagon Lounge will be given by Jessica and Charlotte Blunn from Bay House and Crofton Schools. Welcome to the beginning of another fine season with Havant Chamber Orchestra, as we continue our regular series at Ferneham Hall, Fareham and our association with Emsworth Baptist Church with a second visit in the spring. This October we bring you our usual eclectic mix of well- and lesser-known works. Extending our mini-survey of Richard Strauss in the previous season, I'm really delighted to perform his Duet–Concertino featuring two of the orchestra’s wind principals, Robert Blanken and Richard Moore. Both lyrical and rhythmical, typical of Strauss, it also brings a harp onto our stage for the first time in my association with HCO. With that in mind, I’ve seized the chance to explore that sound by programming works by Faure and Elgar to join with the Strauss. Masques et Bergamasques, Fauré’s 1919 four-movement suite, combines elegant and simple orchestral textures (contrasting perfectly with the richness of Strauss) with perfume and colour throughout this set of dances which include minuet, gavotte and pastorale. Also by Fauré, the ever-famous Pavane opens the second half of our concert. No matter how many times I conduct this work it never loses its appeal. Again, the composer weaves the most effective of aural textures using very clean orchestration and harmonic spacing: a great example of less is more in orchestral music. We perform the version without the chorus, which I much prefer for both musical and practical reasons. Before the Concertino, the harp combines with dark, and sometimes shimmering strings for Elgar’s moving “Sospiri”. One of the composer’s more profound utterings, Sospiri (meaning “sighs” in Italian) was written in 1914 and is understandably imbued with that instantly recognisable, deep melancholy that only Elgar could find. After the interval and the Pavane, Schubert’s spontaneous, effusive 5th symphony completes our season launch – another composer who writes with lean, lithe textures and great rhythmic power. Written for small orchestra, without timpani, trumpets or clarinets, it gives at least one of our two soloists a rest after their earlier concerto. I hope you’ll be able to join us throughout the year and particularly at the start of our season to enjoy such a diverse mix of stunning music, and thank you for your continuing support of the orchestra. (c/w other orchestral works by Faure). (c/w Oboe Concerto and the 2 Horn Concertos). (c/w Introduction and Allegro, Serenade, and Elegy for strings, Vaughan Williams Greensleeves Fantasia and Tallis Fantasia, and Delius Brigg Fair). 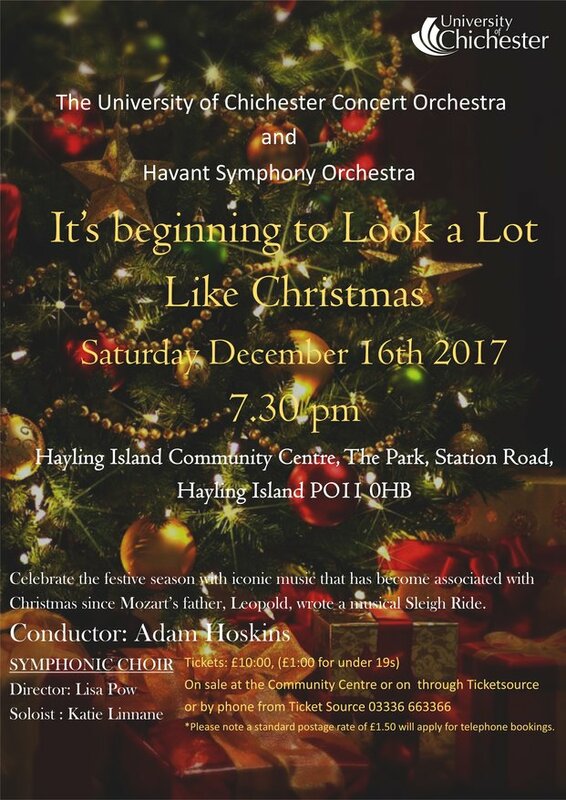 There will be a concert entitled “It’s beginning to look a lot like Christmas!” at Hayling Island Community Centre on Saturday 16th December at 7.30pm. The concert will be performed by the Chichester University Concert Orchestra who are very generously donating the proceeds to HADOS. 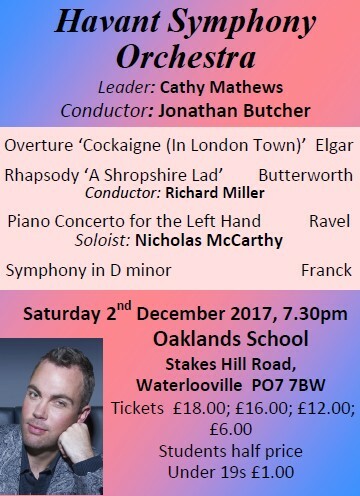 Some HSO players will be joining in and we are sharing the organisation of the event so do come along and enjoy some Christmas favourites — it promises to be a superb evening and will (hopefully!) contribute to our funds. Tickets will be on sale online and at the Community Centre soon — keep an eye on our website for the latest information!